hi.....just wanted to share this with you and will be submitting it to the midnight madness..
Gorgeous,What a sweet little girl.Goodluck with the challenge. OMG, I have been waiting on the edge of my seat for your entry AND it is soooo worth the wait. You just get better and better. It is such a joy to come and look at what you create. Thank you for sharing with us. This is so pretty. She is just adorable .. I really like the lace you have on this card. Hope you are feeling beter. Your card is gorgeous I love the image of the little girl, and the flowers and ribbon around her. Just gorgeous. 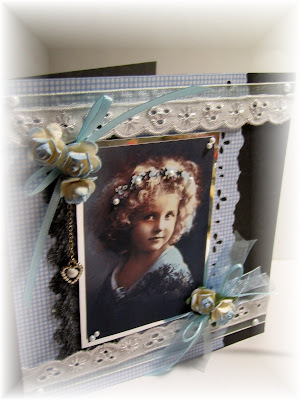 This is just beautiful..love the lace and the punched borders! the image is soo beautiful. don't worry about giving the black and white technique a go..that is how we learn. i borrowed it from someone else so it is not mine anyway!! I would love to see what you come up with. give me ashout when you complete your card. I am truly flattered that you would want to case it. Breathtakingly beautiful....Sassy you have done it again!! Your cards just keep getting better...and just when I think I've found my favourite....nope......you surprise me again with another stunner!!! 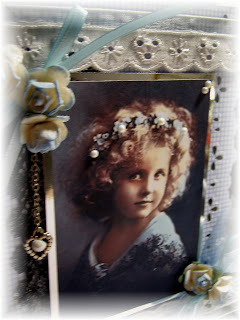 Don't know how you do it but you have such a wonderful ability to create the most stunning cards....I'm jealous LOL!!! 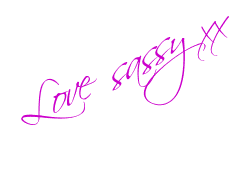 This is absolutely beautiful, Sassy! WOW!! I'm now a follower! Thanks so much for playing with us! !